Here, the Swedes have for years been talking about a housing crisis. This “crisis” has been given extra urgency by the other “crisis” – the steady stream of nyanlända, literally translated from Swedish as ‘the newly-arrived’. In response Göteborg will create one thousand temporary homes* in the city; both on land and on water. They are temporary in the fact that they only have building permit that lasts for 15 years or that belong to secondary housing markets and therefore have no tenure. The new homes are for the newly arrived, but also other groups that find it difficult to house themselves such as students and the long – term homeless. The new build will use a modular system, such as IKEA’s bo-klokt. Other solutions include rehabilitating closed down old people’s homes. Curious to know what other places have come up with, I had a read of this weeks papers. Which seems to have gotten very excited about the following two “solutions”. Maybe the one that has received the most media attention is the artist Banksy. The official Dismaland website announced on Monday that the larger construction materials of Banksy’s art piece will be sent to the camp in Calais, near the Eurotunnel entrance in Nothern France, where people live who have not yet been able to cross over to the UK. 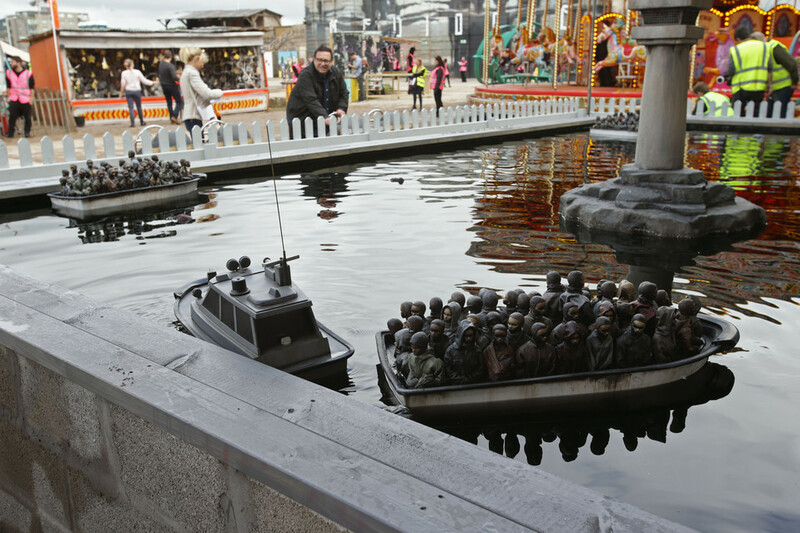 Ironically, one of the installation of Dismaland even scoffs at how the United Kingdom deals with refugees. Another one that caught the media’s attention was the transformation of the garden of Dachua, the former concentration camp where the Nazi’s murdered over 40 000 people, into living space. In the next blog, I will go beyond a head line scan and write a little more about scalable solutions to the increasing and more diverse housing needs in Europe. Any good leads? Would love to hear from you!